Join us for a 1 day Creative Workshop on the Arts, Music and Song Writing which is inspired by the Gospel. 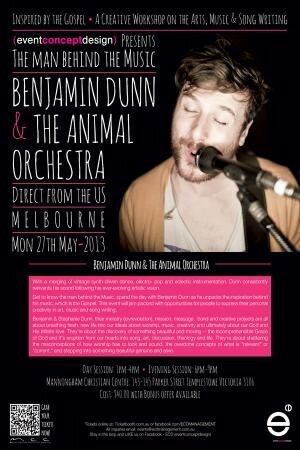 Benjamin Dunn and The Animal Orchestra. With a merging of vintage synth-driven dance, electro-pop and eclectic instrumentation, Dunn consistently reinvents his sound following his ever-evolving artistic vision. Get to know the man behind the Music, spend the day with Benjamin Dunn as he unpacks the inspiration behind his music, which is the Gospel. This event will jam packed with opportunities for people to express their personal creativity in art, music and song writing. Benjamin & Stephanie Dunn, their ministry (joyrevolution), mission, message, band and creative projects are all about breathing fresh, new life into our ideals about worship, music, creativity and ultimately about our God and His infinite love. They're about the discovery of something beautiful and moving -- the incomprehensible Grace of God and it's eruption from our hearts into song, art, discussion, theology and life. They're about shattering the misconceptions of how worship has to look and sound, the overdone concepts of what is relevant or current and stepping into something beautiful genuine and alive.